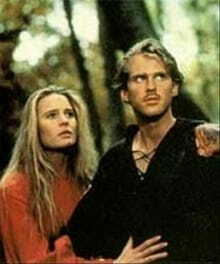 There is a scene in the whimsical and quirky film The Princess Bride in which some bad guys were chasing the two main characters, Princess Buttercup and Wesley. In order to escape, Buttercup and Wesley ran into the treacherous Fire Swamp (insert scary music and creepy feelings here). The Fire Swamp has three challenges: fire spurts, quicksand, and the ROUS's - rodents of unusual size (stay with me...). At one point in the Fire Swamp adventure, Princess Buttercup fell into a pit of dry quicksand, instantly vanishing. Her brave hero, Wesley, quickly grabbed a sturdy vine then plunged in to save his true love. Moments later both characters emerged from the quicksand gasping for breath, stunned by the events that had just taken place. Stress can clutter our lives, consume us just as fast and leave us gasping for breath, stunned. When we find ourselves in the fire swamps, we ask question after question: How did this happen? How did I get here? How do I get out of this scary place? Does anyone know I’m in this pit? Who will be my hero? Falling into the quicksand of situational fire swamps becomes a greater risk when our souls run on empty. Without a doubt, I’m more vulnerable on the days when my schedule is so full that my God-time is minimized. You probably know what it feels like to have a day filled with activity but a heart filled with empty. I imagine you, too, feel at times as if all you do is work, work, work and give, give, give. You feel lonely among crowds of people and wonder if anyone really sees you or if anyone really cares. At times it seems we all have too many obligations, too much stress, and not enough strength. In order to survive these pitfalls, we must wait upon God – the One who won’t grow tired or weary. He has strength readily available for us and knows where to direct our steps. “He gives strength to the weary and increases the power of the weak. Even youths grow tired and weary, and young men stumble and fall; but those who hope in the LORD will renew their strength. They will soar on wings like eagles; they will run and not grow weary, they will walk and not be faint” (Isaiah 40:29-31, NIV). King David said it like this, “I waited patiently for the LORD; he turned to me and heard my cry. He lifted me out of the slimy pit, out of the mud and mire; he set my feet on a rock and gave me a firm place to stand. He put a new song in my mouth, a hymn of praise to our God” (Psalm 40:1-3a). Stress happens. Fire swamps of life come and go. There’s really no avoiding them. We can, however, be spiritually prepared to face their challenges. God equips us – strengthens us – as we wait on Him. As we trust in Him. As we dwell with Him. Have you refueled in His presence lately? Take time to meet with God one-on-one today. As the psalmist wrote, “Let us go to His dwelling place; let us worship at His footstool – arise, O LORD, and come to Your resting place, You and the ark of Your might” (Psalm 132:7-8). The journey to becoming a God-strong woman is all about personal contact with Jesus. You and I will experience greater peace and deeper faith as we determine to respond to His constant invitation to come. But don’t worry... Jesus is no stranger to stress. He walked the same earth we do and dealt with the struggles and strains we deal with. He loved many a stressed-out woman while here on earth and many more before and since His ascension. He knows your stresses – your Fire Swamps – your distractions – your stuff – and invites you to come just the same. When we position ourselves in the presence of the Peace-giver and look to Him to lead and prioritize our heart matters, the strengthening begins. Take time to consider your priorities, evaluate your online activities, and determine what life-clutter needs to stay and what needs to go. Examine your heart, your exhaustion, and the pains of your yesterdays. Take an honest and, possibly, uncomfortable look at the material, emotional, social, and relationship clutter that keeps you from the freedom that God intends for you to experience. Then – once you eliminate what you don’t need – renew and rejuvenate your soul space with what you do need: spiritual disciplines like a daily quiet time, personal worship, and God’s Word. Are you ready? Ready to move to a fresh place of soul rest and spirit strength? Ready to simplify your faith and press on to become the woman that Jesus is really calling you to be? Gwen Smith is a speaker, worship leader, recording artist and the author of Broken Into Beautiful. She co-founded the popular online devotional and conference ministry Girlfriends in God and has shared her songs and stories on many national television and radio shows. Gwen and her husband Brad have been married since 1993 and stay busy with their three cool kids who are now officially: two tweens and a teen. Connect with her at www.Facebook.com/GwenSmithMusic or visit her website at www.GwenSmith.net.